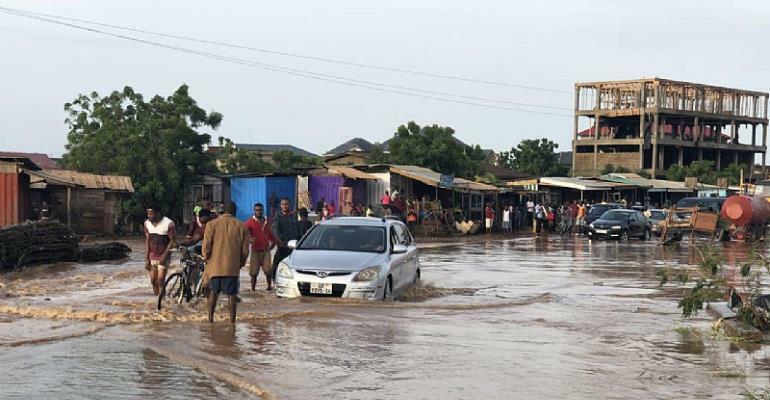 Avenor and Awudome residents in Accra are in a state of mourning as a young lady believed to be in her 20’s, and a man believed to be in his 30s were found dead after the Sunday heavy downpour. The young lady according to sources slipped into the drainage in front of the Electricity Company of Ghana at Avenor now PDS. Narrating the sad incident to HotfmOnlinegh.com, an eye witness who gave his name as Kofi Gang said, the man, who is yet to be known was earlier on seen directing traffic before he was washed away by the flood at Awudome. An official of the urban search and rescue team of the National Disaster Management Organization on patrol duties said that they found the lifeless body near a drain in the area.